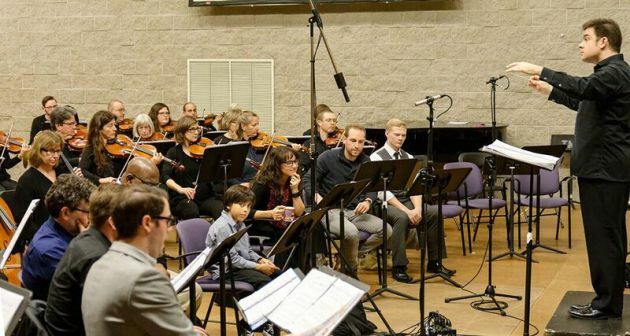 Led by conductor Michael Christie, the cast and orchestra of Minnesota Opera's new commissioned work based on horrormeister Stephen King's bestseller "The Shining" presented a workshop sneak peek on Friday at the opera's rehearsal space. Front row, center to right: Alejandro Vegas as young Danny Torrance, soprano Kelly Kaduce as his mother Wendy, baritone Andrew Lovato as father Jack (Brian Mulligan will sing the role for the May world premiere) and tenor John Robert Lindsey as Lloyd the Bartender. Photo by CJ Standish. It's a safe bet that nothing resembling the line, "Did you remember the parking brake?" has ever before been written for an opera. But there's a lot of new ground being broken with Minnesota Opera's new commission of "The Shining," arguably Stephen King's best-known horror novel and also immortalized on film. With music and libretto by two Pulitzer winners (Paul Moravec and Mark Campbell, respectively), the commission, premiering next May, promises to be a noteworthy addition to the opera's new-works initiative, which has previously brought musical adaptations of modern classics including "Doubt" and "The Manchurian Candidate" to the stage. Both composer Moravec and librettist Campbell were present at a private workshop of the opera's First Act Friday night, held at the company's rehearsal space in the Warehouse District of downtown Minneapolis. Moravec seemed to like what he heard, smiling as he tapped a foot to one of the cinematically grand orchestral interludes used to convey the passage of time. Opera supporters in the audience included Margaret Wurtele, John and Ruth Huss, Sara and Jack Donaldson, William White and Gus Blanchard. "Opera is about three things -- love, death and power," Moravec said. "This story was practically an opera already." He likened the story to the biblical tale of Abraham and Isaac: "He's getting instructions from a higher power to both protect his son and to kill him. It's unresolvable." He said that, with the aid of multimedia effects, "psychological unease" will build, creating "moments of genuine shock." The opera follows King's book, not Stanley Kubrick's film, which King famously dislikes. Moravec summed up key differences as "Wendy is smart, Hallorann the cook is a hero, and Jack isn't crazy from the beginning."